Very sour this sweet is a gum texture and has a fruity flavour. 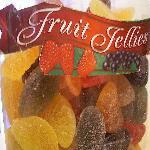 Mouth watering soft jelly fruits covered in a light sugar coating. When Jamie Oliver was in our shop we talked about Juicy Lips or having Juicy Lips!...A cherry flavour soft in texture. Similar to sports mixture. 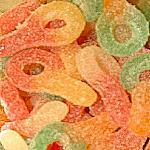 They are small fruity sweets, the black ones taste of liquorice. A very popular old favourite. 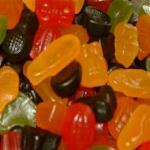 Wine gums are very tasty. I like the red ones. Or try midget gems which are smaller.